As teenagers, we feel like the future is open to us. The idea of going into debt isn’t scary because the repayment comes years later — and we just figure that we’ll have a good job and be able to pay off the debt. That’s not an easy task. The number is almost too huge to really process. 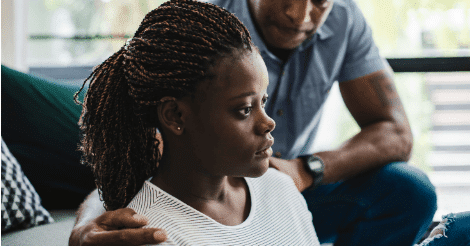 But there are things you can do to help your child understand the huge obligation related to student loan debt — and encourage them to look for other options so they avoid major student loan mistakes. In most high schools, there’s not much taught in the way of financial literacy. That means it’s on you to explain how student loans work and show them how interest works. Explain that students borrow to pay for school, and they usually don’t have to pay anything until they graduate. However, once they graduate, they start making payments. Each loan for each year is a separate debt, however. As a result, they end school with several loan payments to make each month. Plus, they pay different interest rates on each loan. All of that adds up to actually paying more than you borrowed in the first place. Debt always leads to paying more than you took in the first place because interest is the price you pay for using someone else’s money. One way to approach this issue, suggested several group members, is to use a student loan calculator. Plug in the numbers so that they can see the realities. FinAid offers a student loan calculator that provides a great breakdown of the situation. Show your child that because of how student loan interest works, you’re not just paying $80,000 in student loans. What you don’t pay during school is added to your loan — and then you end up paying interest on the accumulated interest as well. From this calculator, you can see that you’ll pay $47,826.11 in interest. That’s half another college education! Is It Better to Pay Off Interest or Principal on Student Loans? One way to reduce the amount of interest students pay over time is to at least make interest payments during school. You have the option to make minimum payments or interest payments while attending college. If students choose to do this, there is less accrued interest to add to the loan balance after graduation. However, paying on the principal, when possible, is also beneficial. The principal is the original amount borrowed, so the lower the principal balance, the less interest is charged. The problem with student loan payments is that interest and fees are taken care of first, and then what’s left goes toward reducing the total amount owed. Let’s say your student loan payments amount to $650 per month. However, your interest amounts to $400 per month. The first $400 of your payment goes toward the interest. The remaining $240 reduces the principal. With realities like that, it’s not hard to see why it takes, on average, 19.7 years to pay off a bachelor’s degree. One commenter suggested taking students through the realities of an entry-level salary as well. You can use websites like PayScale to get an idea of what your student might make in a first job out of college. For example, the average starting salary for a Class of 2018 college graduate was just over $50,000 a year. Putting that into perspective might also help your student understand that their debt will amount to more money they can make during a whole year of work. When deciding if a large student loan is worth it, consider how much you can realistically make. Some majors, like STEM majors and medical degrees, can potentially offer a high enough salary to cover the cost. However, humanities degrees — and even some expensive law degrees — won’t yield enough to cover student loan payments. Even with good careers, though, a word of caution to teens makes sense. “Guess what, my husband with his big school name degree, makes the same as these guys who went to public universities,” says one commenter. Once you get out into the job world, an expensive school just might not matter. You can still make a good salary even when you attend a less-expensive school. Finally, talk to your student about what they expect their lives to look like. It’s not easy to get a teenager to look to the future, but it’s possible. Consider showing them your own expenses, so they can see, practically, what is normal for housing, utilities, gas, insurance, groceries, and other costs. Even looking at the sheer numbers, as many in the Facebook group suggested, might not be enough to impress upon a 17-year-old the realities of making student loan payments. One commenter suggests letting students practice by paying some of their expenses. Letting your kids actually practice can make a big difference. Use the FinAid calculator to get an idea of a monthly payment. 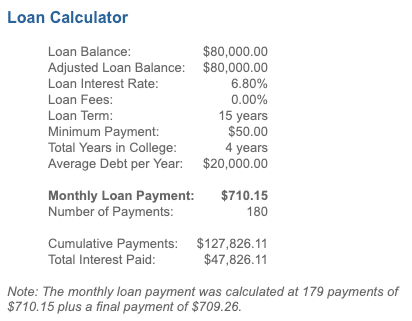 In the example above, the monthly payment was $710 for 15 years. Divide the $50,000 salary by 12 to show your child that they would make $4,167 per month. Go down the list of expenses, including that $710. Show them how quickly the money goes when they have debt. You can then run through the scenario with a smaller amount of debt, and even use an investment calculator to show them how they could become rich by borrowing less and investing the difference. It’s hard to help a 17-year-old understand the financial consequences of the decisions they make right now. It’s also important to realize that you’ll probably have to repeat the conversation more than once. My son is 16 and we’ve been having these conversations since he was 12 — and he’s only just now starting to really get it. Keep pushing, though. The more you talk about money, how debt works, and the realities, the more likely your teens are to make better decisions. Newer PostAccepted To College: Should I Hold Out For More Money Before Committing? Older PostDo You Have To Pay Back FAFSA?